The water heater is one of the most ignored plumbing appliances in the household. It sits in a closet or basement, off in a corner, and is pretty much ignored until something goes wrong with the amount of hot water available or the tank begins to leak. Three of the most frustrating plumbing problems that can affect a household are low pressure in the water lines, reduced water flow from fixtures and, of course, not enough hot water. 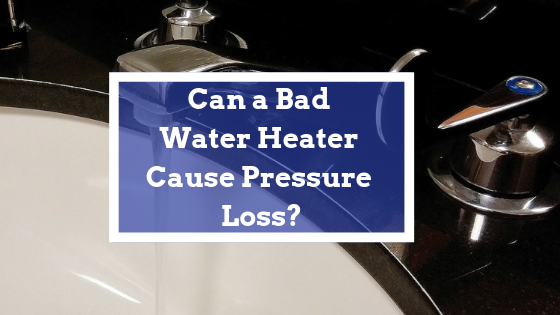 But can a bad water heater actually cause water pressure loss? To understand what is going on here, we have to be clear on the differences between water pressure and water flow, what effects each can have on the overall plumbing system, and how to help prevent performance loss in your hot water heater. Most of us have been there at one time or another. You turn on the tap and only a trickle of water comes out. You open the tap all the way…still just a trickle. What’s going on here? Are you experiencing a loss of pressure or a loss of water flow? The difference can be important when it comes to identifying the cause or causes and can also determine what repairs must be done. Water flow: This refers to the amount of water coming out of a pipe per a unit of time. Water flow is measured in liters per second. How much water is being provided when you shower or wash dishes or do anything else that requires your plumbing system to provide water production. Water pressure: This is the amount of force or energy that is applied to a water flow to make it move through the lines. It also refers to the energy in the water as it exits a pipe or faucet. In most cases, water pressure is created by the pull of gravity. Water pressure is measured in something called kilopascals (kPa). This is simply a measurement of how much force is applied to the water as it moves. Both flow and pressure are affected by the amount of friction inside the pipe the water travels through. Imagine spilling a glass of water on a horizontal pane of glass. The water would easily spread to the edges. Now imagine spilling water on the same amount of sandpaper. It just doesn’t spread as fast. The smoother the pipe, the less friction and the faster the water can move down the line if there is sufficient water pressure. Good water pressure helps overcome friction and helps maintain proper water flow. Pipe size. The proper diameter of pipe is necessary to balance water flow and pressure. A larger pipe can provide greater water flow, but if the pressure is low, the flow will be negatively affected. One way to determine if you have a water pressure or water flow problem is to observe if water flow fluctuates depending on how many lines are in use at any one time. If this is the case, your water pressure is not high enough to drive water through the system when in full capacity. If your water flow is low at one line but not others, you have a blockage. If your water flow is low at all faucets all the time, you likely have a central blockage or restriction that is affecting the whole house. However, if only the hot water is demonstrating low flow, the best place to start looking for a cause is at the hot water heater. When water is heated and leaves the hot water heater, it should flow with the same energy or pressure as the cold water. If it doesn’t, the problem is likely the water heater or the lines from the water heater to the rest of the house. It is important to pinpoint which is to blame or both problems exist. You wouldn’t want to have to spring for a new water heater only to find that the problem isn’t solved because it was due to corrosion or clogs in the water line. Hard-water buildup in the pipes can block water flow both into and out of the hot water tank and drive the water pressure down. Sediment in the hot water tank, when accumulated, can also lower water pressure. A kink in the flexible water conduit (pipe) typically used with hot water heaters will affect pressure. The shut off valve is not fully open, resulting in pressure drops. The water distribution lines are too small to allow adequate water pressure through the lines into the house. Too many sharp bends between the hot water heater and the faucet can make maintaining correct water pressure difficult. Water pressure into the house from the city is too low (it should be flowing at least at the rate of 40 gallons per minute), and this will have a direct effect on hot water pressure. If this is the case, however, the cold water lines will also be affected. Why is Your Water Heater “Bad”? Lack of proper maintenance can make a water heater seem like it is defective or has outlived its usefulness, but it may just need service and inspection of the lines going into and out of the tank. Flushing out the sediment that builds up in a tank can help keep heater operating at proper pressure and also helps improve the quality of the water. At the same time, any sediment that is driven through the lines from the heater increases the friction in the pipes and increases the potential of clogs elsewhere in the plumbing system. Turn off the gas or power to the heater. Keep the cold water feed on to the tank. This will help remove the sediment as you empty the tank. Attach a long hose to the drain faucet (the hose bib) and put the other end where it can safely drain. Flush until the water that comes out the other end is clear. While flushing out a hot water heater can be a simple DIY project, Benjamin Franklin Bay Area Plumbers recommends calling in a licensed and experienced plumber to perform annual maintenance of your water heater. We not only flush the line but do a professional inspection throughout the entire plumbing system and importantly, the condition of your heater, including the pressure relief valve and thermostat – both critical for safety. Hot Water Taking Too Long?